I’ve been waiting for the full collection of Alexander Mcqueen’s Pre-Fall 2009 to finally come out, and I am amazed once again. The way he integrated faux silhouettes into some of the clothing is just genius (like the last one), I hope this helps bring canes back in style. wow, he did not disappoint–I love it!! He always had a flair for the dramatic but I find lots of these pieces in particular to be more wearable. Thanks for sharing! Thank you SO MUCH for posting these. All I can say is “OH MY GOD” over and over again. SO BEAUTIFUL! It’s reminiscent of what he did for the men’s collection too. 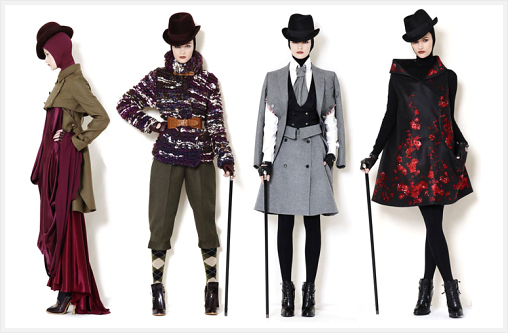 The models look like Charles Dickens’ characters! I loved this collection! I can’t wait until the McQ collection hits Target!